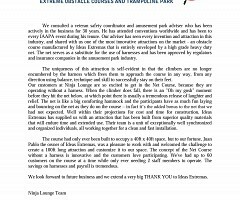 This is the most recent development Ideas Extremas®, has done in which we have placed our design, safety and innovation experience. 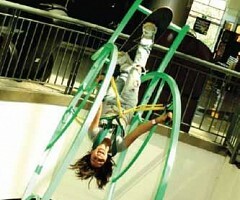 This equipment enables the user to spin in two directions allowing the user to experience an unforgettable sensation of adrenaline and freedom. 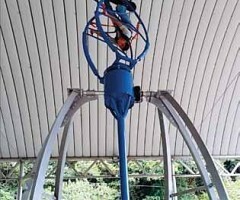 This is due to the fact the user may have acrobatic spins like a helicopter up to a height of 20´, just like in the Winter Olympic Games. 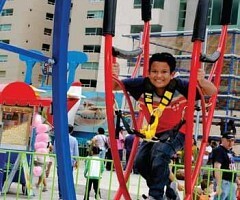 In this attraction users can employ all their physical skills, strength and coordination to maximize their thrill. 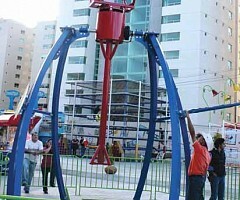 It has an electric panel to determine the accurate moment to free the spins in both ways and it can also be stopped through the control panel to end the user´s participation.